During high summer, from mid-June to mid-July, sun hardly sets down in the Finnish capital. Many locals escape to their waterside cottages to enjoy the long days. But now there is one more reason for staying in the city. 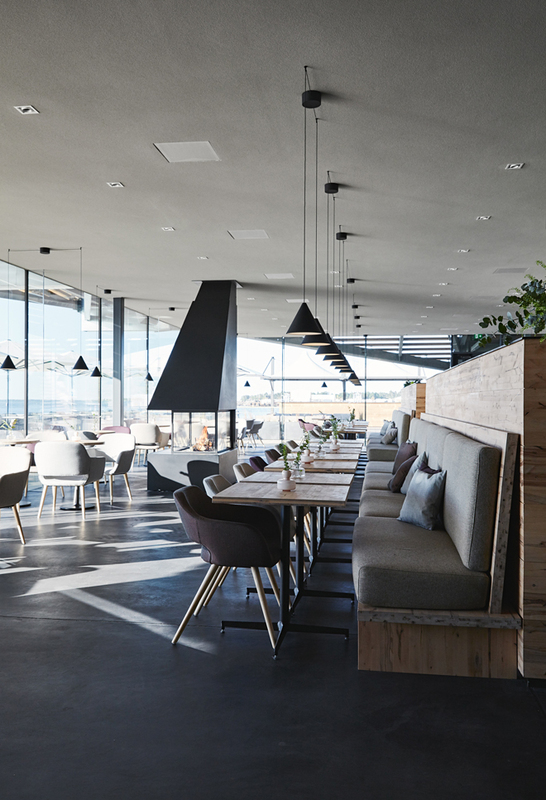 The latest architectural hotspot is Löyly, a public sauna with a bar and restaurant designed by Avanto Architects on the Southern waterfront – literally the hottest meeting place this summer. 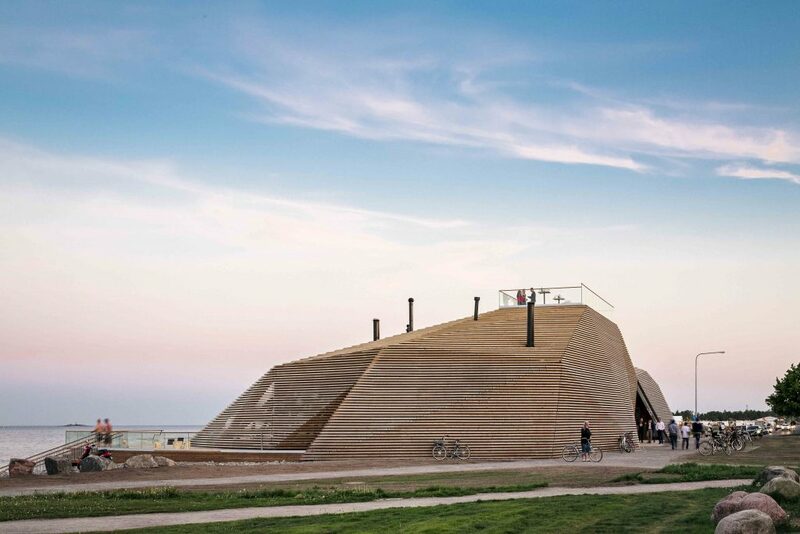 Located in the district of Hernesaari, Löyly’s sculptural form stands out on the coastline, with high-end housing behind it in this former industrial harbour area. 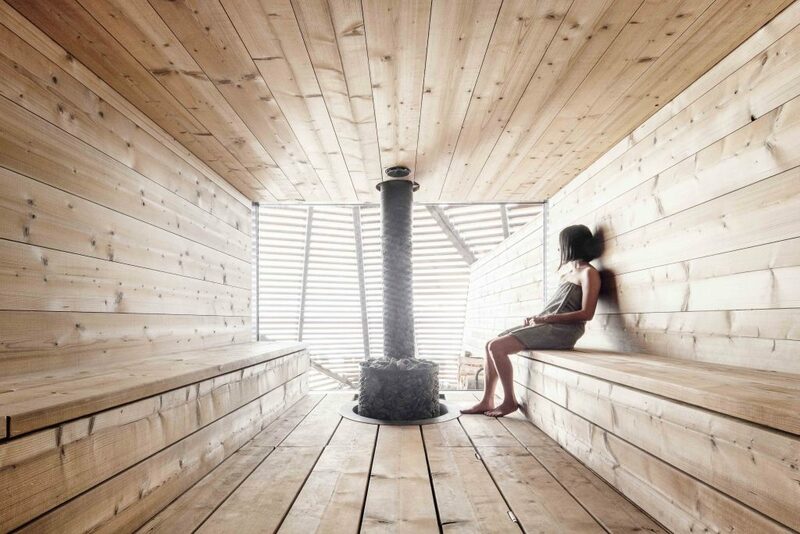 The sauna had been in the plans for several years. Now it’s finally completed with the help of private investors. The smart interiors have been designed by Joanna Laajisto, who is known for an elegant take on contemporary Scandi style. Traditionally saunas are minimalistic and simple and the architects wanted to keep a degree of austerity inside the spaces for bathing. “The lightning is planned so that guests can unwind, relax and focus on the sauna experience” Laajisto explains. In the public areas she used wool to bring softness and a new ecological timber material, with a cool birch tone. Working closely with the Avanto team, Laajisto wanted to avoid any fancy spa-like connotations and kept things nice and simple. 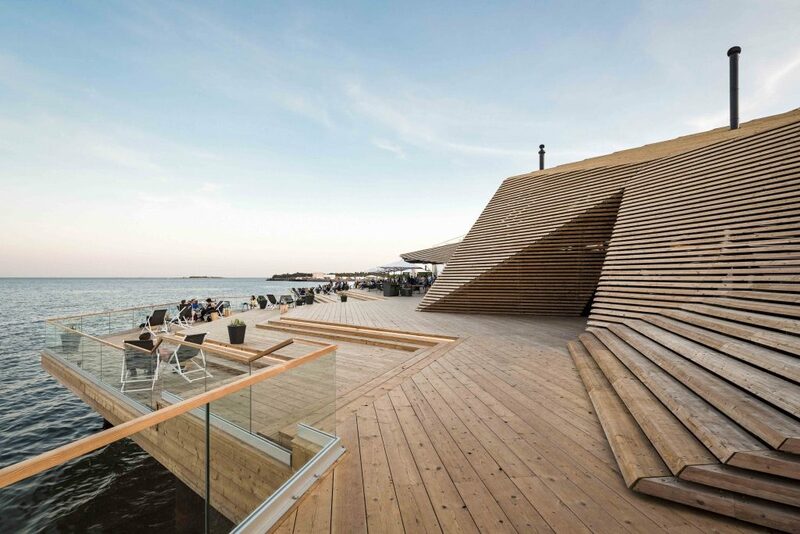 The wooden structure extends over the water and the roof terrace bar provides new perspectives over the city. With time the wood will change colour and blend more into the landscape. The form is designed like a giant rock that can be climbed over. As an architectural concept it recalls Villa Malaparte, nestling over the rocky coastline in Capri. Most Finnish postwar apartment buildings have either shared or private sauna facilities, but at Löyly it’s not only the waterfront location and the stylish interiors that’s special. It’s also the method used for creating the right type of heat. The name Löyly refers to the steam that rises from the oven stones. With a wood burning fire the quality of the steam is always more pleasant. Here they have built an extra large oven (like a giant AGA stove) that gives the best sauna experience and soft heat. 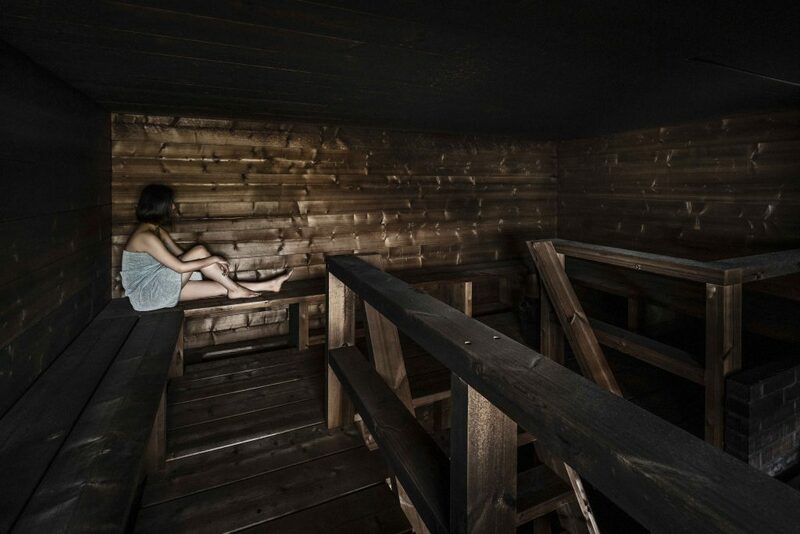 There is also a department for a smoky version of the sauna, an ancient Finnish tradition, harder to find in cities. The Guggenheim site close to the central market place remains empty, but Helsinki’s waterfront has been animated by ever popular summer venues. 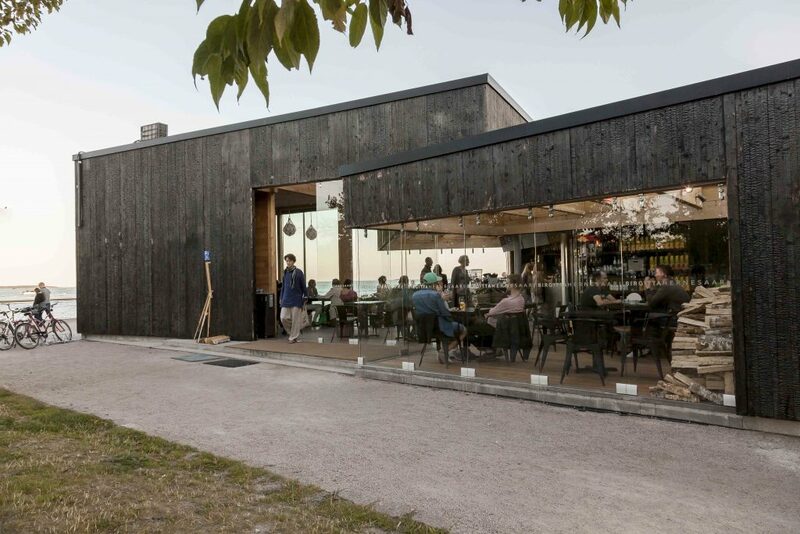 Close to Löyly there is Birgitta, a cafe and restaurant designed in the style of a cool summer cottage in dark burned timber. 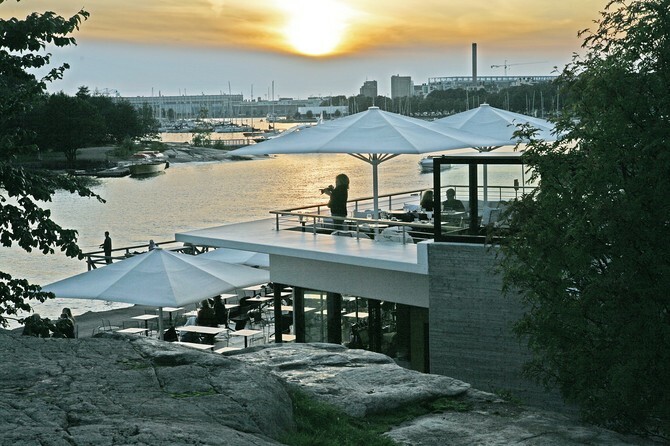 At the other end of the maritime walk in front of Kaivopuisto Park there is Mattolaituri, the popular open-air bar, designed by Helin Architects. Joanna Laajisto was in charge of all the fittings here as well. “The challenge at Mattolaituri was finding the right balance between lightness and weight, so that the furniture works in an outdoor space” Laajisto says. 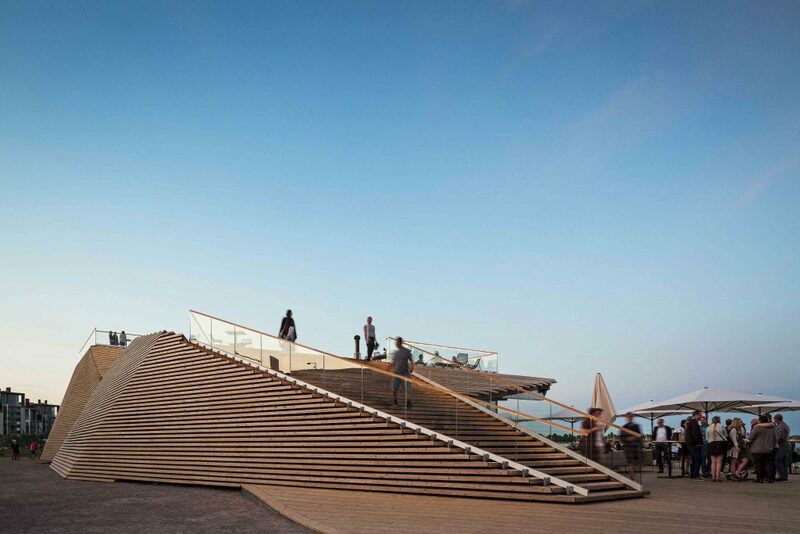 For a city that shows its best side during the summer months, Löyly is a great addition to the waterfront architecture. 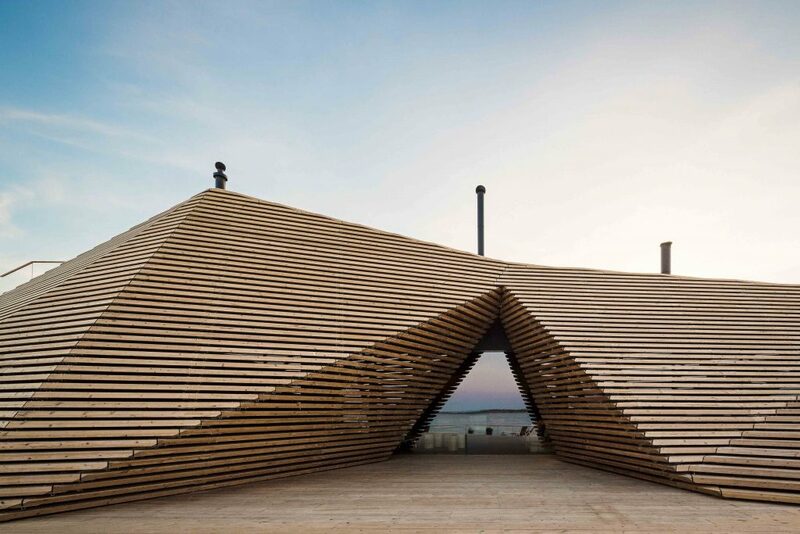 It’s sculptural form enlivens the former harbour area and the overall concept recreates something new of the sauna concept. It will serve both tourists and locals; a spectacular environment for experiencing the nation’s favourite summer bathing and relaxation ritual. And perhaps during the winter for the brave ones, it will be an opportunity to dare the icy waters after sauna, the extreme sport for sauna aficionados. At summer weekends the bar with DJs will no doubt be one of the busiest in town.